Our Quality is the backbone of our company and we leave no stone unturned towards maintaining it. We know that delivering quality products consistently earns the trust and respect of our clients. To achieve high quality standards, a very reliable quality control system has to be adopted. Therefore at Unitech Industries (India), we implement the best production machines and follow strict quality control procedures to produce the world-class stainless steel kitchen products. Each and every product, starting from the designing to making to finishing and ultimately packing undergoes several quality checks before they are finally delivered to the customers. The R&D department of our company, headed by qualified and experienced professionals, provides us with smart and valuable solutions for enhancing our business operations. Equipped with latest testing equipment, machines and apparatus so as to carry out various researches and tests, our R&D department examines the processes and methods incorporated in our company and suggests solutions for emancipating the slacking areas if any. The QC staff of our company is regularly trained to ensure adeptness, efficiency, and competency. Our team regularly studies the market behavior which helps us in producing utensils that are in sync with the changing market demands. All raw materials right from the metal to other equipment are sourced from reliable sources, who have a long tradition of supplying good quality stuff to our company. 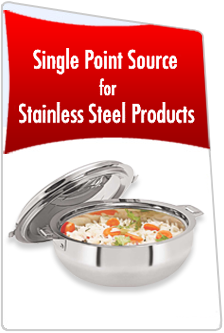 Our quality team maintains a strict vigil on the quality of the sourced stainless steel. We design samples of the products to be manufactured that are approved by our management team and our customers. We make use of advanced techniques in our sampling and designing department to enhance the practicality of the utensils. All the designs are developed with proper attention to detailing of designs and patterns. We are proud owners of various superior quality machines which are used in making the products in different shapes and sizes. We ensure during the manufacturing process itself whether the product formed is same as given in the specs or not in terms of shape and size. TOur QC team is always alert in the final finishing of the product so that the desired aesthetic appearance is achieved. Once the product gets a finishing touch, the final products are send for another round of checking. Our quality experts again check the product, so that the minute problems (if any) can be detected. The packaging and final shipment are also done by our quality department. We ensure that only the optimal quality products that conform to international quality standards are delivered from our factory premises.